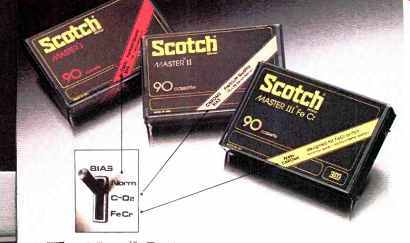 A Scotch cassette for every switch position. Three totally different tapes. Each developed to deliver the truest, clearest sound possible at each tape selector switch position. Our Master I cassette is for normal bias recording. It features an excellent dynamic range, low distortion, uniform high frequency sensitivity and output that's 10 dB more than standard tapes. Our new Master II replaces chrome cassettes and is designed for use on hi-fi stereo systems with chrome bias (70 microsecond equalization). It features some spectacular performance characteristics, including a special coating that gives it a 3 dB better signal-to-noise ratio at low and high frequencies than chrome cassettes, yet it's less abrasive. 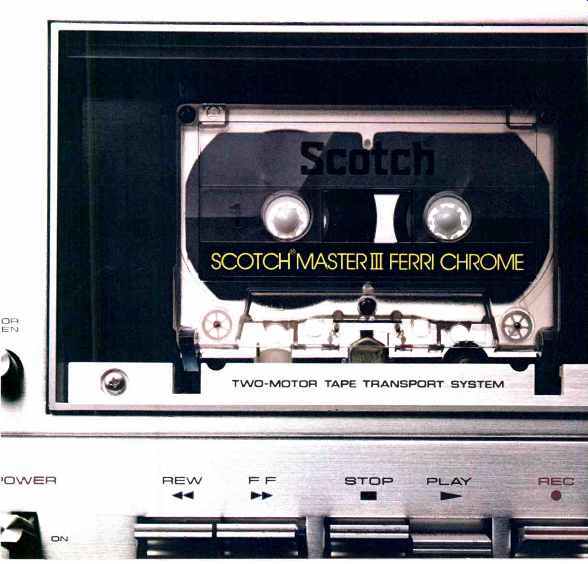 Our new Master III is for the ferri-chrome setting. It's formulated with the most advanced technology available, giving a 3 dB output improvement at low frequencies and 2 dB at high frequency. And the unique dual layer construction increases both low and high frequency sensitivity over chromium dioxide and ferric oxides. All this, plus unique inner workings you can actually see. Our new Master line has a special bonus feature. A precision molded clear shell that allows you to monitor the inner workings of the cassettes. You can actually see the recorder head penetration and the unique roller guides in action. Look closely at the transparent shell and you’ll see the water wheels which were specially designed to move the tape evenly across the head, reducing friction and noise. And two radially creased shims insure smoother wind, improved mechanical reliability and reduced wow and flutter. Enough said. Now it's time for you to take the true test Match up the right Master cassette with the bias you prefer. You'll find that whichever switch position you use, a Scotch Master is the way to get the most out of it.